Award winning manga by Yumiko Ooshima. Chibi-Neko is a young kitten who has been abandoned. She doesn’t know she has been abandoned, and doesn’t know the difference between cats and humans. Indeed, she imagines herself as a human girl and believes she will become human someday. She is found and rescued by a boy named Tokio, who has just graduated from high school. However, he flunked the entrance exams and now is not sure of his future or what he will do. Chibi-Neko soon begins to love Tokio and wants to become a human and marry him someday. But then she sees Tokio with another girl in the park, and sees that he is in love with this girl. She also keeps getting visited by Raphael, a mysterious male cat who tries to tell her that cats cannot become human, they are always cats. What will Chibi-Neko do? If you love adorable readings, this is a must read! You won’t be disappointed! This was adapted into a 1984 anime movie. The anime starts at chapter 1 and ends at chapter 3. Click here to watch! Thanks for doing this project, you guys. What a gorgeous classic manga. 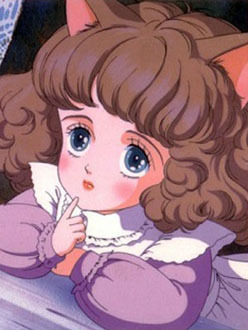 I’m sort of thrilled to find out that the first catgirl may have been this adorable Alice-in-Wonderland child type unlike the modern sexed-up versions.